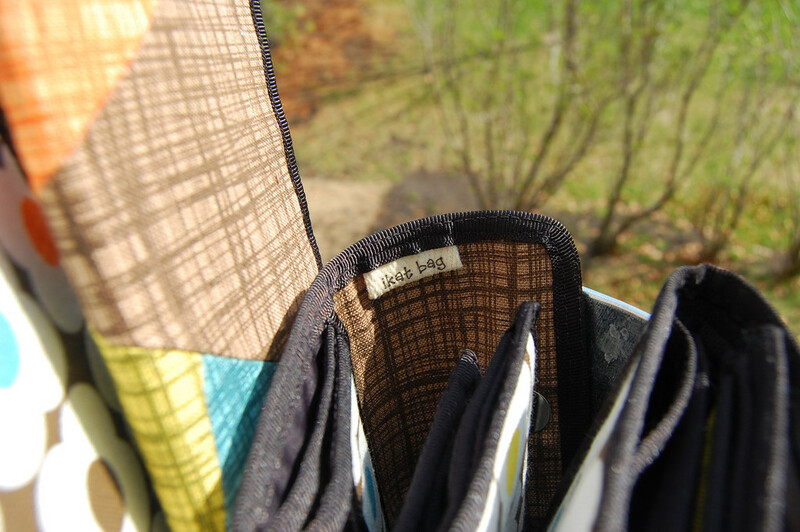 ikat bag: A Bucketful of Wallets, A Little Orla and a Giveaway! 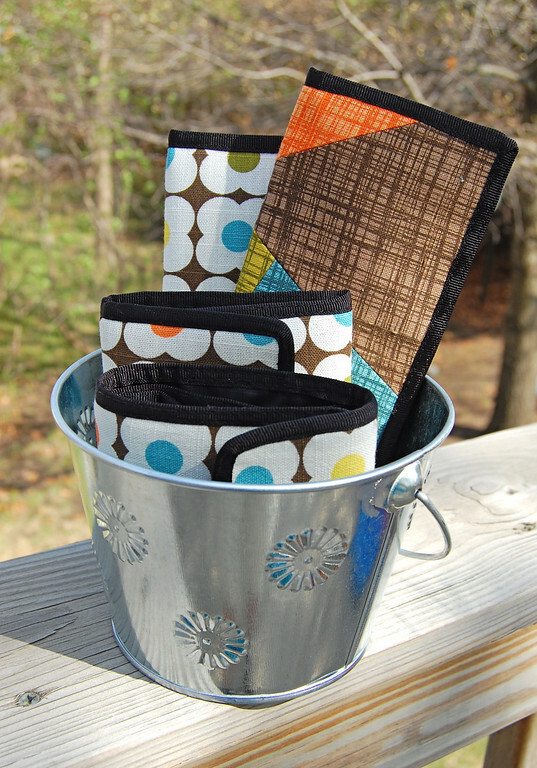 A Bucketful of Wallets, A Little Orla and a Giveaway! know it's a bad habit - mass-producing is oddly satisfying. 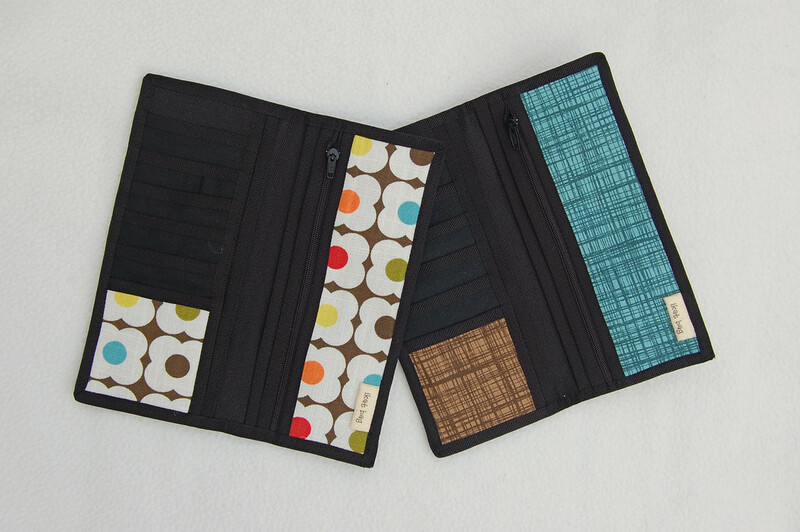 open a velcro wallet now at offering time! Not cool. felt drawn to the store-bought black nylon ones myself. just as it did the now-dead wallet. Very fiddly. no pictures of the other two kids. when a person becomes this lazy. called 600 denier nylon. This is what I use for my wallets. you don't need lining unless you want some extra color. well....umm... let's just say why even bother? replenished several times, but this is all that is left. where to go when I run out. when my supply runs out. So ready for the giveaway? and give these both away! drawing on Saturday May 9th. Good luck! * edited to add the last bit about the random drawing - duh. Sorry about that. Can you tell I haven't done enough giveaways? Oh my word - I just love your wallets!!! I don't think I deserve to go in your giveaway as I've been an occasional lurker and I'm not sure I've commented before. 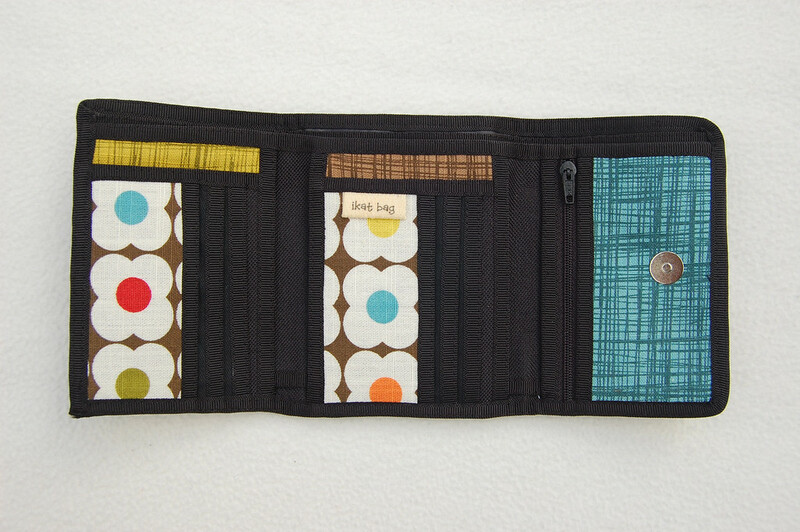 Have you got plans to sell patterns for your wallets? 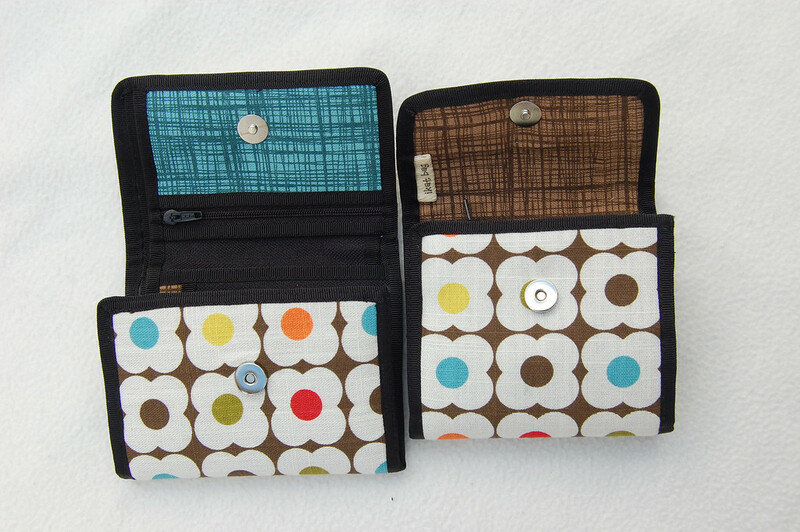 I think they'd do really well as it's so hard to find a decent wallet pattern. 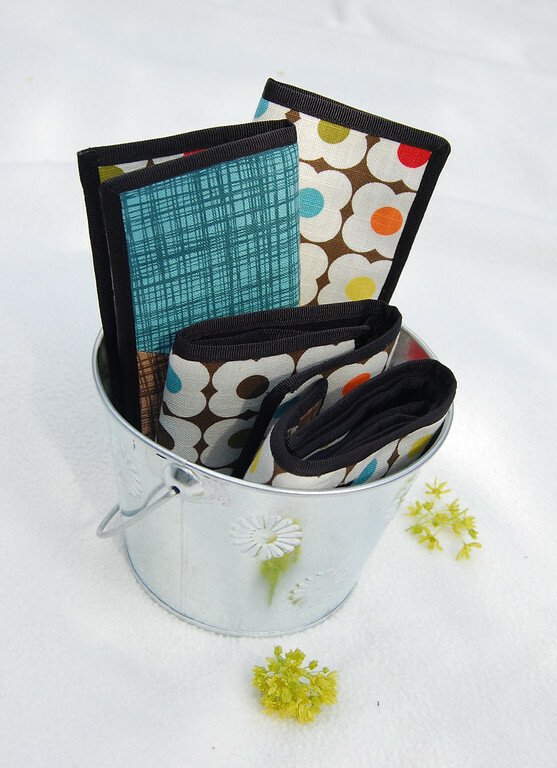 Great way to use those Orla placemats. I can't imagine how we can live without Target here in the UK! Those are amazing! How are you so productive with three little ones? I haven't even been able to look at my sewing stuff for so long now and I only have two! 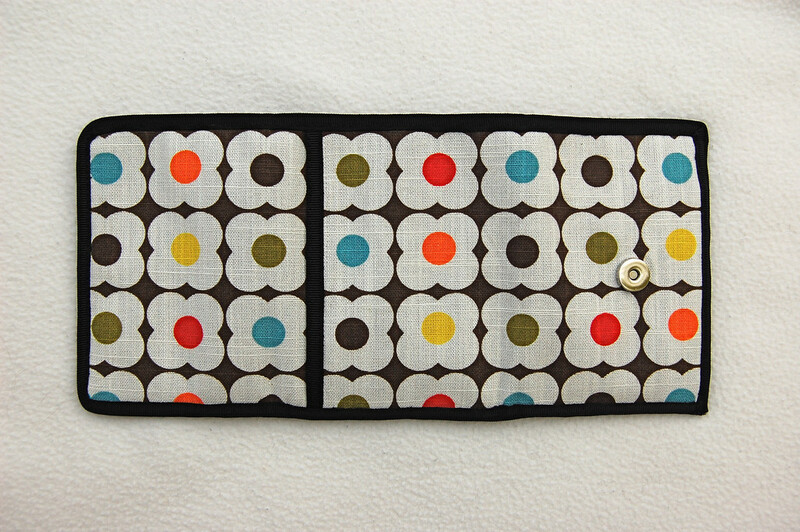 congrats on the 100th post and on those wallets - very cute and well thought out. OMG! I'm in total awe! I make so many things, but I don't think I would tackle these... so many little nooks and crannies. Anyway, I'm absolutely loving these and would be thrilled to win one. I must admit this is my first visit, via sweetie Rachel at One Pretty Thing. No suggestions until I have time to rummage through your 99 previous blogs! Thanks for the chance to win! 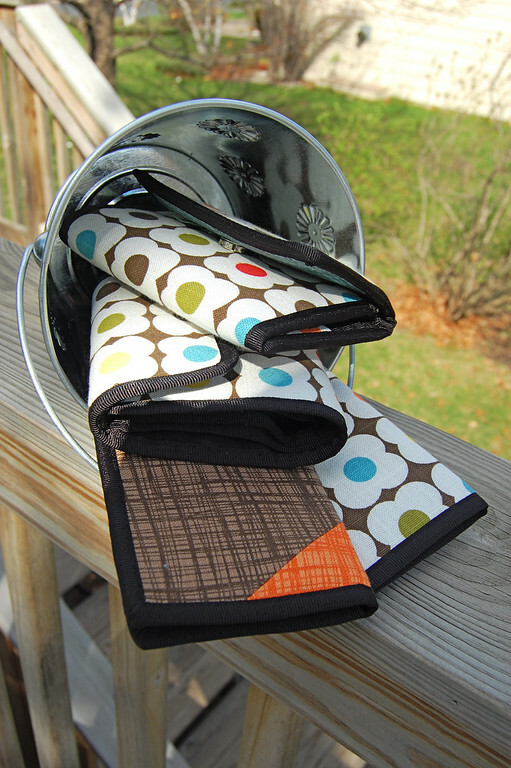 These are wonderful wallets and I love the fabrics! I just discovered your blog through a link to your play garden at One Pretty Thing. 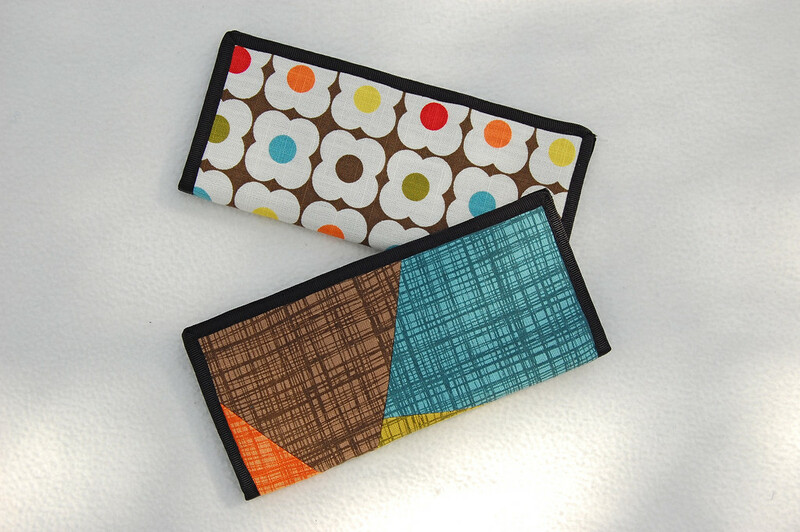 Love your stuff, and the wallets are gorgeous! You're very talented. I also just discovered your blog via oneprettything...and am adding it to my favorites! Love your wallets! I just discovered your blog too and am so glad I did. Such gorgeous stuff and the wallets are pretty and practical. I would be so honoured to win and use one of them. hi lorraine i still have your wallet AND haversack bag from when i was 13 and you were 19! must take a pic of them one day and show you. Your wallets are beautiful! I was eyeing the Orla fabric at Target the other day trying to figure out what I could do with it! I didn't see the brown flowered pattern, though. Love that. 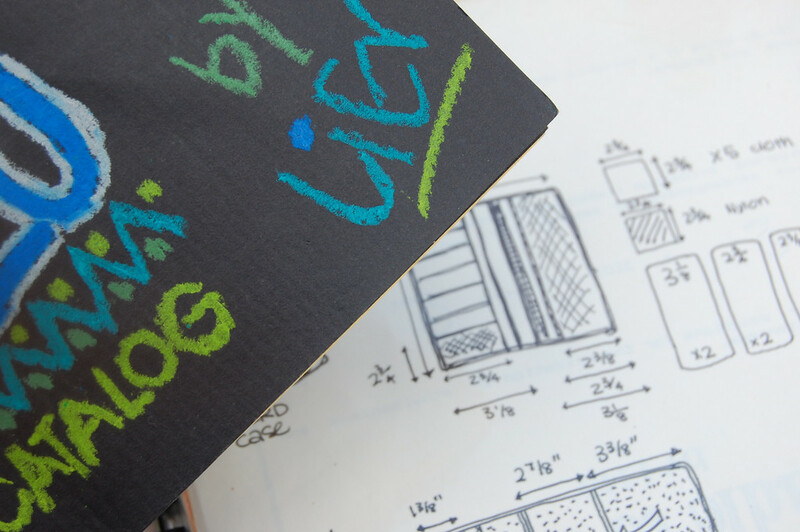 I love your blog and your projects. For your next project, can you explain how you find the time, energy and creativity to do it all, while being a mom to your girls? Oh, and in your pictures, your house is always so neat! And I'm thrilled that you are 'back in business' so to speak! I can certainly vouch for the quality of your work because every single bag/wallet/bucket/whatever you've ever made for me is still in use today, and none the worse for wear! What I'd like to see on future posts? Why, MORE of your genius, of course! (btw, I will be going to sg next thu for a week. Email me your shopping list if you want). keep up the amazing ideas! Beautiful work. Theses are so very lovely!! Orla stuff is just so RETRO. What a super job you've done with the whole repurposing of placemats! No Target for us in the UK!! Boo, hoo!! Will have 2 go mad and bring an extra suitcase for fabric next time I'm in the States!! Congrats on reaching 100 posts. Am about to "go live" myself!! Think I may be late to the party, but what the hay!! So I've now read two posts! Thanks for coming into my crafty/sewing/inspiration world. 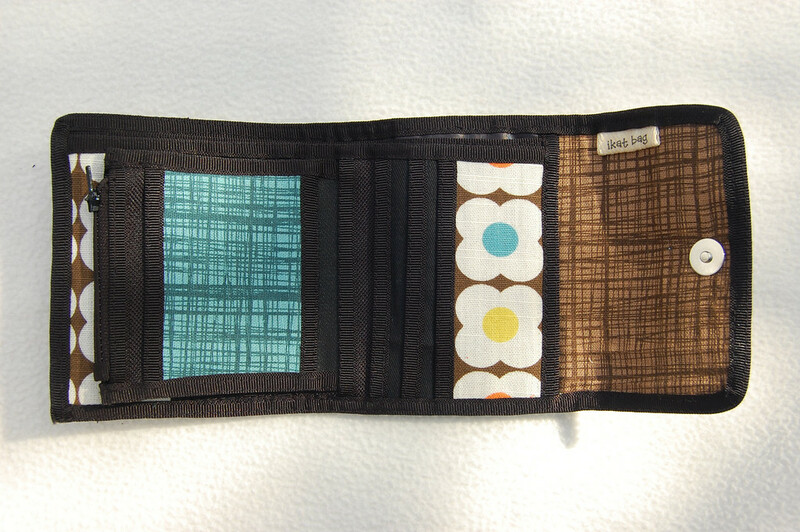 love your wallets, I have thought about making one but why when someone else does such a beautiful job. did you make one for me? hee hee, we'll see. Just want to say I've enjoyed reading your blog - I'm amazed at your creativity ! I was so inspired to start sewing again that I actually finished a dress I started 4 years ago. How about making some tote bags ? I saw some cute ones with cupcake fabric (not available in S'pore) on Etsy - I would love to buy one. I just found your blog and I love it! Your skills are amazing! (I'm thinking of the plantable dirt but your skill at recreating the wallets is impressive too.) Love the wallet, thanks for the chance to win it. I would love love love one of those wallets. I wish I had some suggestions for your next 100 posts, but my friend just introduced me to your site so I haven't been around very long. But you have definitely been added to my google reader subscriptions. Wow! 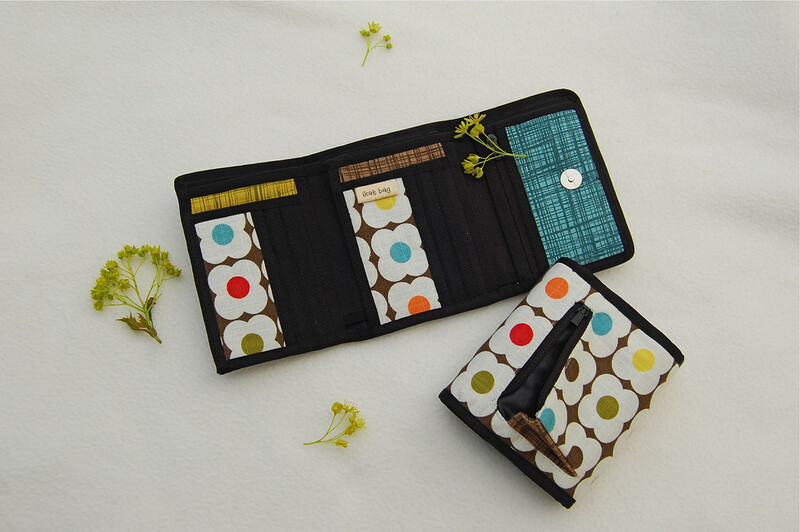 Those wallets are amazing - your attention to detail is terrific! I'm sure I can't begin to say what I'd like to see in the next 100 posts as I'm blown away by the few I've just read on my first visit! I love your blog and was especially surprised and intrigued by the foam series. Honestly, I couldn't have thought to ask for something like that, so really I'd just love for you to carry on as you have been. I do admit, however, that everything I try to sew turns out wonky. I tried the oven mitts last week and they looked deformed and I could not figure out the bias tape, so they ended up really sad looking. Is there any progression of projects from easier to harder that you could recommend to sharpen my skills? How did you learn? Any suggestions would be appreciated! Your wallets are soooo great. My one is just falling apart, but I am not brave enough trying to make one myself. I LOVE the flower material--I need to check out Target's fabric/table linens! I also love the Orla fabric! I have made a reuseable lunch bag out of it. THis blog is so cool! Those are so great -- I can't believe you MADE those! Blown away, as usual. I'm creeping up on post 100 too...argh! Thanks for your comment; I'm so glad you enjoyed the tops! I think you could sell ANY of your amazing creations (maybe kits for making stuff out of cardboard for kids? felt?). I'm sure the wallets would be a hit as well...so professional looking. Just found your blog and I am in love. The infatuation might wear off when the reality of my limited capabilities comes crashing down, but for now, I am loving your ideas. I want to make a foam garden! I like your wallets and will head to the Target tableware section for inspiration! I so wish I was as crafy as you! I love those. I find your blog through One Pretty Thing. I love your tutorials!!!! This is one of the coolest wallets I've ever seen. Who wouldn't want one?! Your blog and products are great - keep it up! I love the wallets! So generous. You must come and enter my coneflower giveaway too. Thanks for the opportunity to win. BTW, I found you on One Pretty Thing. This is my first visit, which probably counts me out of the giveaway, but I couldn't pass by without commenting on your wonderful wallets - truly lovely. I have bookmarked you now so will be popping back! I think you should continue your blog as it is. I love the tutorials and patterns! Wow, what a generous and historic giveaway! 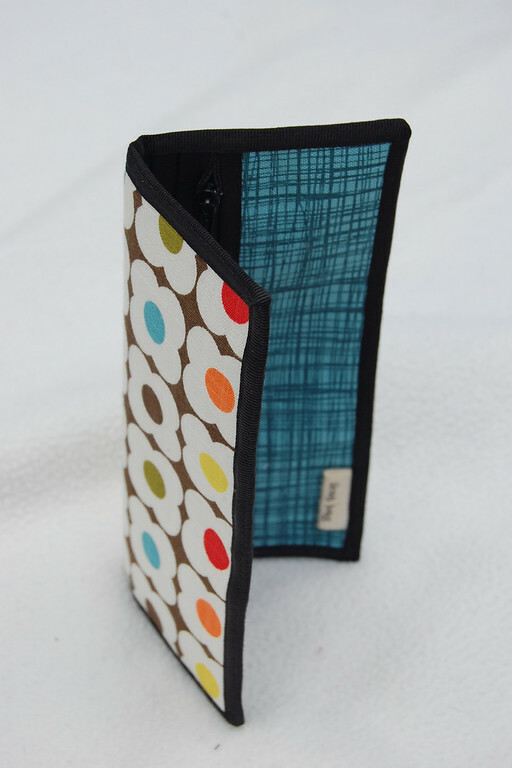 Those wallets are amazing and I love that you used Orla's fabric! I for one would LOVE to see more tutorials. The ones you have posted absolutely blow me away. I have a feeling we'll all be seeing more of them in the future, but more likely on Martha or in an upcoming book. Your creativity is amazing and I am totally in awe! 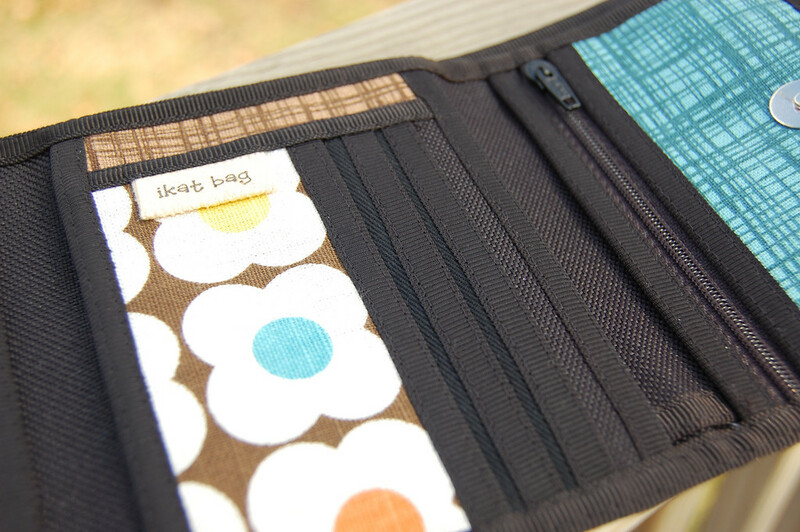 I'm so impressed by your wallets, I love the idea of hidden pockets!! WOW! the detail that you put into these things amazes me! I too favor the simplest, albeit holds the most kind of wallet. the one I carry now I got at target, it has a hinged coin purse that pops open when dropped ( often). I've been thinking I should switch to a separate change purse but that seems like even more to carry! I am so impressed at your level of detail with projects while parenting. Love the wallets! I just found you, so will look forward to going back to the past hundred posts. your wallets are amazing! you are so creative. 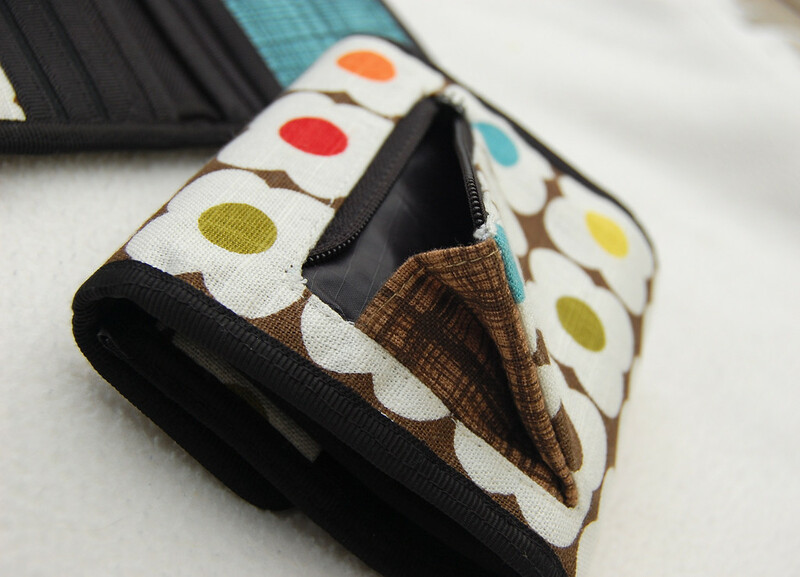 who would have ever thought to make wallet!? Your wallets are so nice! I would love to win one! I just recently found your blog and have been so impressed with all your ideas. I am mentally filing them away for when my little boy gets older (he's only 6 months old now). I hope to see more great ideas in the future! 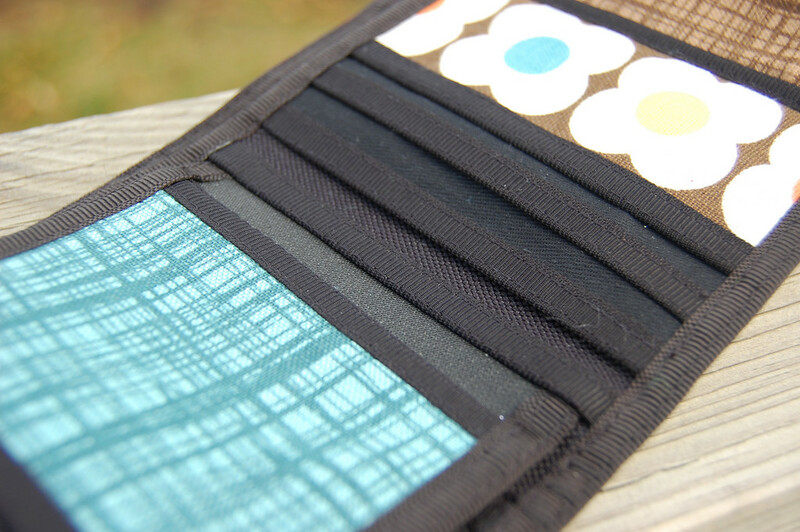 I would love one of these wallets orginal!!! I'm so glad you won my fatquarters you are so talented!!! Those are so lovely! I would love to win for my birthday (the 9th)! I found my way here from Ohdeedoh and their link to the felt food projects. The donut vendors are so cute! I'm just looking around and I love the projects for the kids -- I've sent more than one to Grandma. I would much rather have fun fabric toys than another plastic bit around our house. Oh, your wallets are fabulous! I just stumbled into your site via Ohdeedoh!!! LOVE it!! Love the donut shop from December, too. I am now going to subscribe to see what else you are up to! As for what to see, as a toddler mom, I'd just like to see whatever you do related to your kids!!! Thanks for the fantastic giveaway. Congratulations on your 100th post! I'm playing catch up as my computer died a couple weeks ago. 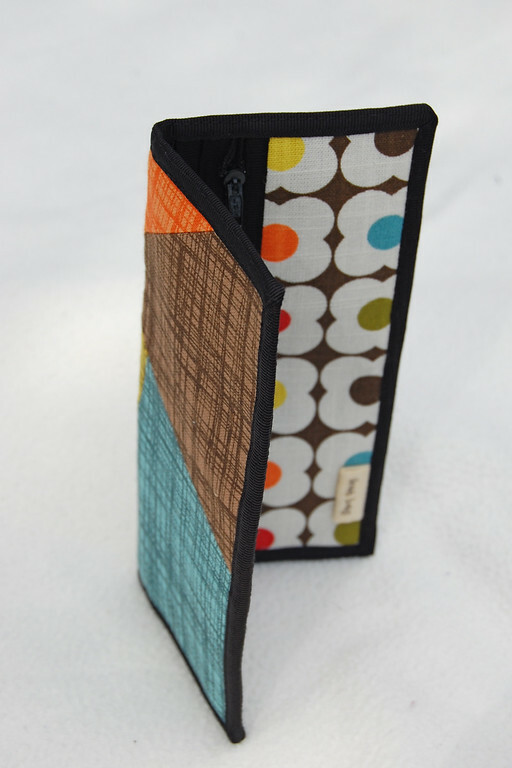 So glad I didn't miss this opportunity to enter your giveaway for those fabulous wallets! This is brilliant, was here looking at the wonderful cake you make using felt (via one pretty thing). thot i would pop by before we leave. not sure how long it would take before we get internet access. u must tuck in a buck in the wallet if i win ok? so my wallet will always be full. I love your wallets... so much nicer than what you can buy. And I like your choice of colors, as well. You sew beautifully. My seams are not always so straight! 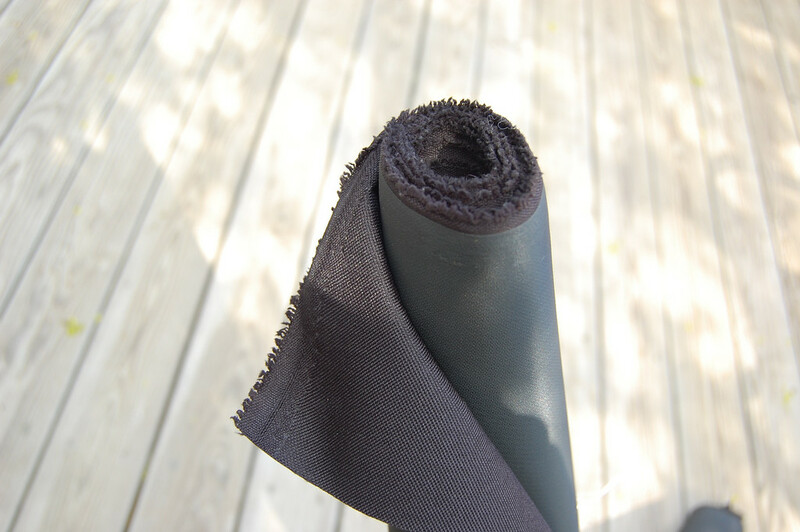 Don't know if you still need the nylon or not but the http://www.therainshed.com/ sells coated denier nylon along with just about any other tech fabric you can think of. They are a great shop here in my hometown but they do sell online also. :) BTW i loooove the wallets. Are u selling them?? How can we buy them??? Hi Anonymous (who left the most recent comment) - I just opened an etsy shop yesterday and there are two wallets in stock there.